Tank Help - The Chip's Challenge Wiki - The Chip's Challenge Database that anyone can edit! 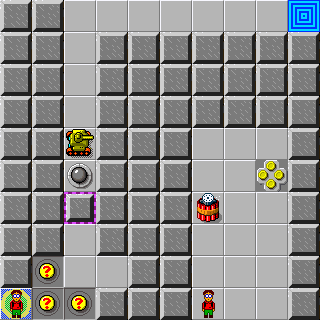 Tank Help is the 86th level in Chip's Challenge 2. It was created by Anders Bager. It is the first level in the game to feature multiple playable characters. This level has twin Chips. Both must exit. To switch Chips, press the <Switch> key. Use the yellow tank to open the gate, then blow your twin out with dynamite. This page was last edited on 20 January 2019, at 16:48.